57.38.70 – The Weaver Lever™ allows your outboard to remain upright while your inflatable is in the vertical position. 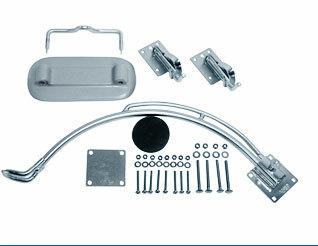 A motor bracket for leaving the outboard motor on your dinghy when stored on Weaver Davits. 13 inches of clear transom is required. 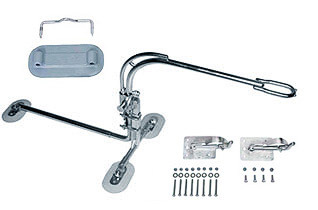 The Weaver Lever™ is designed to be used with Weaver Snap Davits. It allows your outboard to remain upright while your inflatable is in the vertical position. 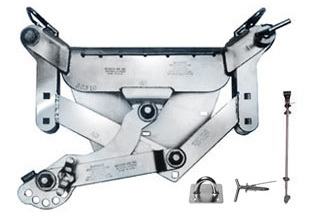 The Weaver Lever is made of rugged stainless steel and is manufactured to accommodate outboards that are mounted to pivot either to the port or starboard (see illustration). It can handle outboards up to 85 lbs. max. Transom must not be more than 1 1/2” thick to work with the Weaver Lever. 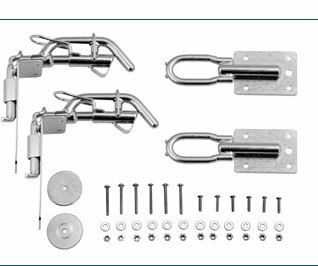 Davits on LEFT OR RIGHT need to be noted too. A Work Sheet is availiable to download.